Welcome to this week's comics! They are, uh, going to get a little weird. Speaking of weird, here's a fun piece I drew as one of our monthly Patreon bonus drawings. 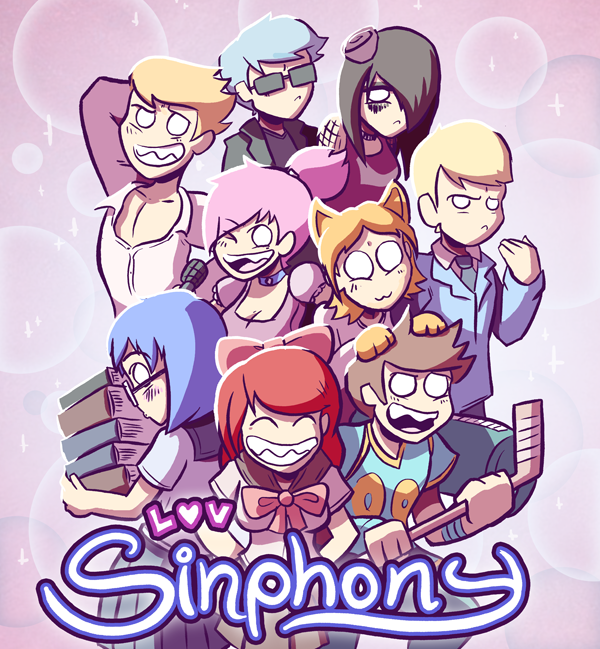 Backers wanted to see what a Sam and Fuzzy dating sim would look like, so I decided to take it in the strangest direction I could think of... one where all the dating options are various previously unseen personas of Sin. A dating Sin, if you will! Come back on Wednesday for more weird science. See you then! Alas, there is no Samurai Mafia, no! I generally tried to populate the S&F universe with relatively distinct criminal faction mashups, rather than making a bunch of other ____ Mafias. (Except, of course, for the Cyborg Mafia... they had been mentioned in a throwaway gag in an old comic, and I couldn't resist building off that!) Hence, we've got Grrbils who resemble a Biker gang, Vampires who function as a secret order, Cats who have an elaborate criminal monarchy, Natalie Graves and co repping as an unscrupulous corporate conglamorate, and so on! "I got my new books the other day and they look so good! I'm very happy with them. Definitely a worthwhile upgrade from the original vol. 1-4 softcovers, and now I have those to give to my friends and make them read this comic that I never shut up about! Everyone's a winner. There is a problem though, and it leads into my question. The first 2 omnibuses have that beautiful slip case to protect them from the ravages of dusty apartments, but the new ones have to sit out in the elements and slowly grow resentful of their elder books. Can we expect a fix to that at some point? There's basically two reasons why we didn't make a slipcase for the new hardcovers. The first is that the story told over these three hardcovers (or five softcovers, for those with the paperbacks) still needs one more book to complete it. So I definitely didn't want to make a slipcase for all three, and leave the future fourth on it's own. We briefly considered making a box just for the first two, but opted not for the second reason... the truth is, making those dang slipcases is very expensive! They cost nearly as much to manufacture as an entire hardcover books does. And unlike the original omnibus campaign, this time around we were were printing three big book interiors instead of just two. Throwing a box into the mix just wasn't in the cards. Ultimately, I decided the best thing to do would be to just leave the slipcases off the table for now. My hope is that we'll be able to fund a slipcase as part of the inevitable kickstarter for our next book. That case could hold your three currently unboxed hardcovers, plus the next one, and thus house the complete "NMS" series story that began with Fix Your Problem! "In last week's Q&A you mentioned that if you were to make a S&F game, it would probably be a visual novel. I've been playing all sorts of different games for almost 2 decades, and my absolute favorite- bar none- is the Ace Attorney series, a visual novel about a badass lawyer. I would love to play any story you created in visual novel format. Ha! This is really more a question of time than will, my friend. I would love to make a visual novel -- I also love the Phoenix Wright games! But even if I was only handling the writing, making a visual novel would be a big job! 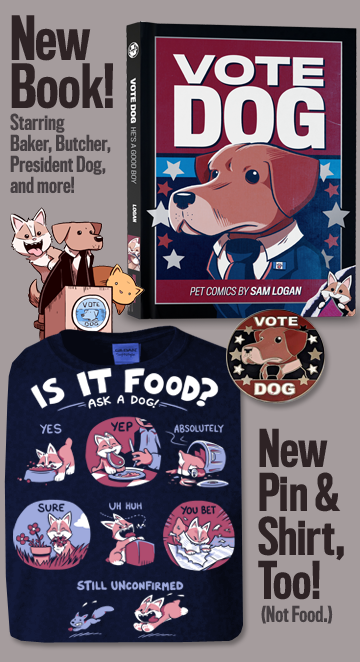 I don't think I could pull it off while I was also writing and drawing Sam and Fuzzy full time. Maybe someday, though! Hazel talked about being a "bad influence" on Fuzzy in a slightly less condescending way back in the Most Wanted storyline. That was a rare moment of openness... this cold snark is a little closer to Hazel's usual speed. We return on Friday with a new comic! And you know what else returns on Friday? A new round of our far-too-long-absent Q and A features. 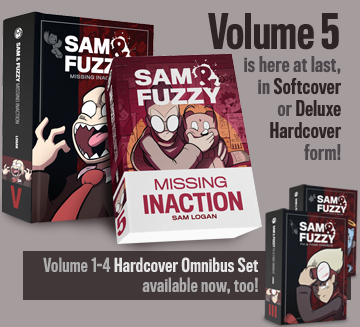 If you've got a question you'd like me to answer -- about Sam and Fuzzy, comics in general, or the world beyond -- just tweet it at me, or plunk it in an email with "Q and A" in the subject line!